Boreal Chickadee Lives In The Arctic Year-Round. How? At the edge of the Arctic lies the vast boreal forest. In summer, it’s home to legions of nesting birds, from warblers to loons. In early autumn, nearly all these birds depart for warmer points south. By November this dark land of spruce and firs is a cold, forbidding place. Yet one remarkable songbird stays behind: the Boreal Chickadee. This tiny, dark-capped fluff-ball lives here year-round. 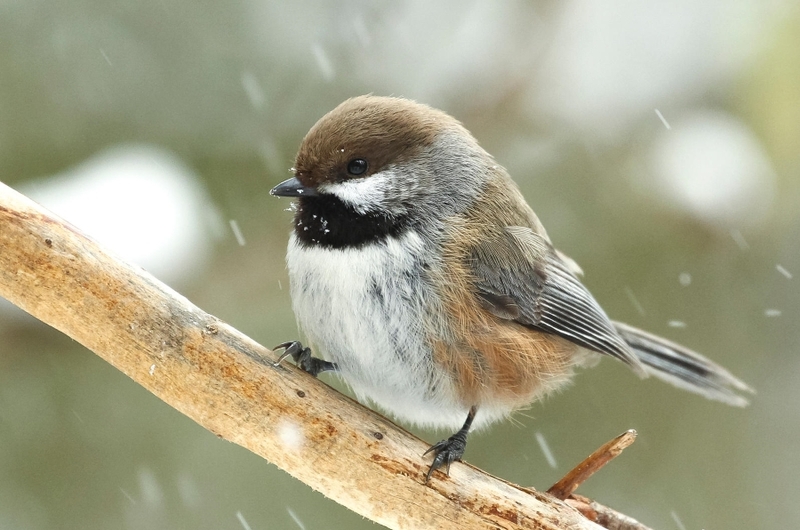 How do Boreal Chickadees survive the harsh winter? First, during summer, they cache a great deal of food, both insects and seeds. Moths and beetles and even aphids are stashed away in bark crevices, and under the rough edges of lichens. The chickadees also store a lot of spruce seeds. Then in fall, the birds put on fresh, heavier plumage. And their feathers are more dense than most birds’, creating a comfy down parka for the chickadee. And most impressive, the chickadees adapt to deep cold by lowering their body temperature at night from 108 degrees Farenheit to just 85 degrees. In this way, the birds conserve their stores of insulating fat. So hats off to the Boreal Chickadee, a truly rugged bird — even if it weighs only 1/3 of an ounce. They lower their body temperature! This is a form of torpor, right? Not full hibernation but … hibernation light? Black-caps weigh on average only about 11 grams, compared to 77 grams for an American robin. 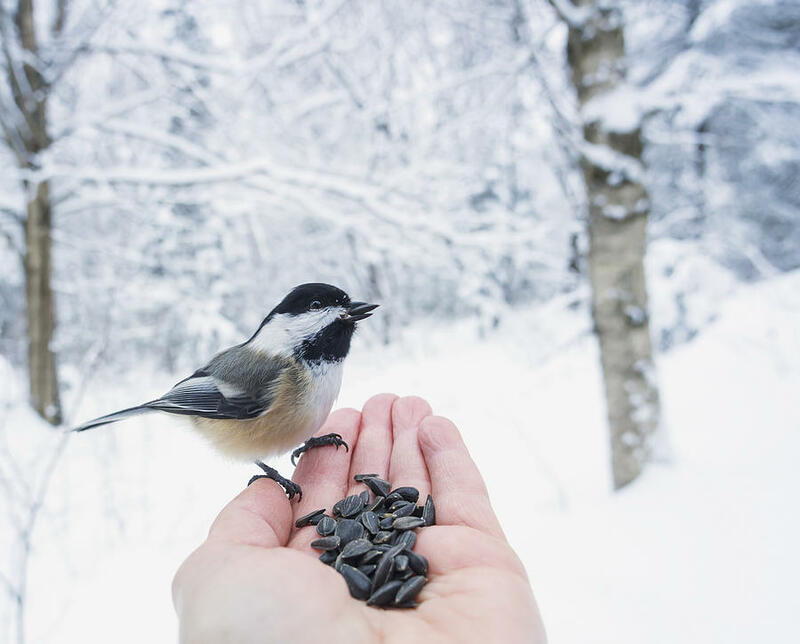 Due to their higher surface-to-volume body ratio compared to larger animals, tiny creatures such as chickadees have developed higher metabolisms to stay warm. This requires large amounts of food—something particularly challenging in winter. For black-caps, that can mean consuming nearly 60 percent of their own body weight each day in cold weather. To survive, chickadees store seeds through summer and fall for winter consumption. The birds also eat seemingly invisible insects and spider eggs gleaned from tree bark. In the deepest cold, chickadees try to find a tree cavity for shelter and enter a torpor called “regulated hypothermia.” A chickadee’s core temperature decreases by up to 15 degrees Fahrenheit, slowing the burning of precious calories. Even still, it is possible for a black-cap to consume its day’s accumulated calories by shivering for warmth all night long. It was 4 degrees here a couple nights ago and I wondered how the tiny black-capped chickadee survived. Really, birds have us beat. This entry was posted in Uncategorized on January 24, 2019 by Bix. This is fascinating! Though shivering all night for warmth doesn’t sound like much fun…. If you are interested in reading more about animal survival in winter and the strategy of torpor, I can recommend Bernd Heinrich’s Winter World. He is fascinated with kinglets, which are even smaller than chickadees, but the mechanism is the same. This looks like a great book. Thank you for the recommendation.